I don’t usually reflect THIS deeply. Its not my style. I think. I look back and I move on.Then I play whatever game I feel like playing that day or start working again. But I realized, there was so much that happened during my 2017 and remembering how I felt back then on each and every highlight just generates a gush of feels. 2017 was definitely the year of constantly being outside of my comfort zone. It was very mentally stressful, barely took breaks but I feel like it was all worth it. This is a very personal story I’d like to share with everyone and perhaps,hopefully, my experiences will help or inspire more people. Also, I can’t mention EVERYTHING AAAAAAAAAAAAAA. I wish I could. So I’m limiting each section to 2-3 highlights with corresponding personal feels. WARNING: MIGHT BE REALLY LONG LOL. Especially the esports part. This Was The Year where I realized I didn’t have a home game to cast anymore. 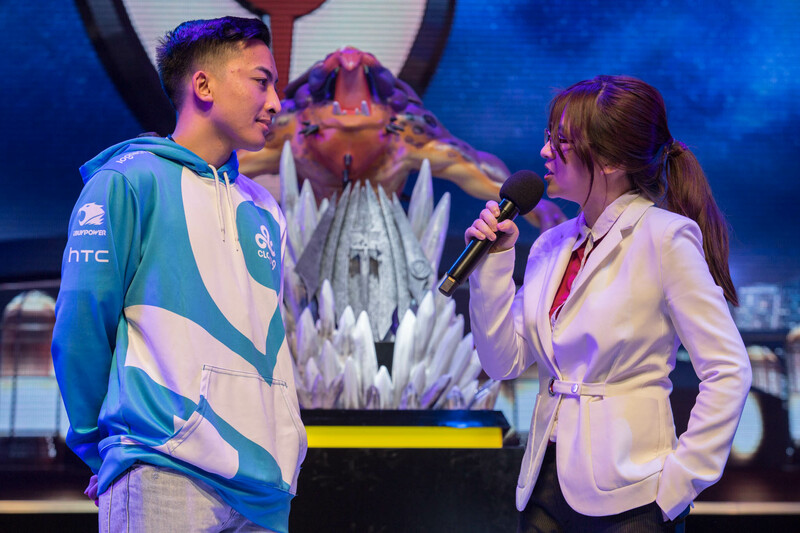 As a caster who solely worked on League of Legends for 2 years, finding opportunities to cast a game you play everyday (Overwatch at that time) was tough, especially if there weren’t any local tournaments to go around. Rampage 2017 came and This Was The Year where I wasn’t a caster for League of Legends PH’s biggest annual event. I was a desk host for the Pro Gaming Series Grand Finale and I was happy to be one. It was my first time but being provided a platform to share my insights as an analyst from way back while I was still casting the Pro Gaming Series and the Garena Premiere League made me happy. That the player stories and team narratives that I’ve built inside my head over the years can still contribute somehow, even though I’m not part of the regular season anymore. There’s really no replacing the un-explainable feeling of working on a scene you’ve been attached to for so long and being with the people you’ve known since the beginning of your career. It’s actually making me teary-eyed right now as I write this. And the feels wouldn’t be complete without Vainglory Worlds 2017. This Was The Year where not only did I get to experience and work as a host/court side reporter on my VERY FIRST WORLDS but it was also the time I got to meet and work with the best talents and teams in their respective scene. I can’t imagine it was just a few months ago at that time where me and Asurai would watch esports VODs and Youtube videos of Vainglory esports to prepare for our cast at VG8 SEA Finals in Indonesia and then BAM! I get to work closely with them on the event. Dream come true. Too surreal. Even until now, I still can’t believe I ended 2017 this way. The crowd, the SEMC staff, my co-talents, Mineski….everyone. They’re all very nice and hardworking and I learned A LOT which helped me grow as a person in all aspects. Its such a huge honor to be a part of Vainglory Worlds. I remember perfectly well how this game led me to camp in my room for a month. This Was The Year where I fulfilled a promise to my past self from years ago (I didn’t have a console back then and I was financially incapable of owning one) that I’d play this masterpiece. And I did. Context: My PS4 was downstairs because the TV is there. It’s a hassle to play since its far from my workstation and pretty much where my family hangs. Can’t get much privacy and had to go up to my room back and forth if I needed to work on something. The caption on my facebook timeline on this picture said “This is the life.” It was, indeed. Watching your favorite esports and then playing your favorite game inside your room the whole dang day was blissful. I felt at peace. It was zen. Everything was positioned on my or near my bed so when I wake up, its there. Momentum and immersion is extremely important when I’m attached to a game and this setup was perfect for me fully enjoy the experience without feeling detached to the work that needs to be done during that time. The effect of this game to me is everlasting. My branding on my channels, my room and perhaps even my approach to 2018 are manifestations from Persona 5. From the art concept to the premise of “Breaking Out Of Your Comfort Zone” and “Removing Your Masks” in order to become stronger and to unlock your true potential or true self has served me well and will still be a guide on most of my decisions. I feel like 2017 was a reflection of that thinking and I’d like to believe that the success that I think I’ve attained for this year were the fruits of this mindset. Knowing yourself more and what you want in life is a huge help. Because once you know what direction you want to go, all you have to do is start walking. I honestly don’t have life all figured out yet. But I am in a spot where I am happy and I’ve goals set already for 2019. This Was The Year where I barely had time to press that pause button. And even if I did, it made me sad. I would feel down not working on anything and playing games just gave me an empty feeling. I was so used to running all over the place, clutching things, grinding my mind with ideas, working on a tight schedule, making content,traveling,etc that once I finally get the chance to take a breather (which was probably just 2-3 instances this year), I would feel really down. My brain was conditioned to work non-stop and doing otherwise would cause anything I do to relax feel irrelevant, meaningless and empty. The effects? I’d break down from time to time. (Its not obvious but it happens) It’s normal, I guess. Its the kind of damage you won’t feel because you’re busy but when it occurs, you just know that you have to do something about it. You suddenly realize that you keep saying “I’m tired” inside your head. And its not good. That was the time I came to a conclusion that I needed another life. A game that would just allow me to forget everything, even for a moment, be someone else and do something that’s NOT related to work. (And yep, it doesn’t help that all the games I’m into are competitive esports titles. Not really a good stress reliever) And that’s how I returned to Eorzea as Shurelia Lune on Final Fantasy 14. And it worked! Like a prescribed medication from a doctor. Man, this turned out to be longer than expected so I’ll just tally up other (random) highlights that happened this year! Crossed out Computex off of my bucketlist. Even meeting my idol LilyPichu, Karsa and Steak. Travelled 8-9 times this year for gaming and esports events! Colored my hair for the first time! Casted Vainglory, Heroes of the Storm and Arena of Valor for the first time! Have/had partnerships and/or worked with Spout360, Coins.PH, Nvidia Geforce Philippines, GALAX, Ragnarok Online Philippines, Seagate, LG and Arena Of Valor this year. Had my very first billboard up with Bacchus! My first complete year with MSI Notebook Philippines as an ambassadress! There’s really no words to describe how thankful I am for this 2017. To the people,companies and organizations that trusted me in the fields I specialize, I thank you from the bottom of my heart. I’m super grateful and happy to be a part of your world and this industry. To the fans and viewers that provide support to the community and to the scene, you guys are awesome! And course, uber thankful to my friends and family that stuck with me no matter what!!! Couldn’t have done it without everyone! ☑ Stream PS4 Games like Monster Hunter World and Dissidia NT ( I finished Detroit Become Human POGGERS! Whew. That was long. I’m sure I’ll have more goals building up as I go along. But this is it for now. Random picture dump for feels! Aww thanks for the effort miss riku!